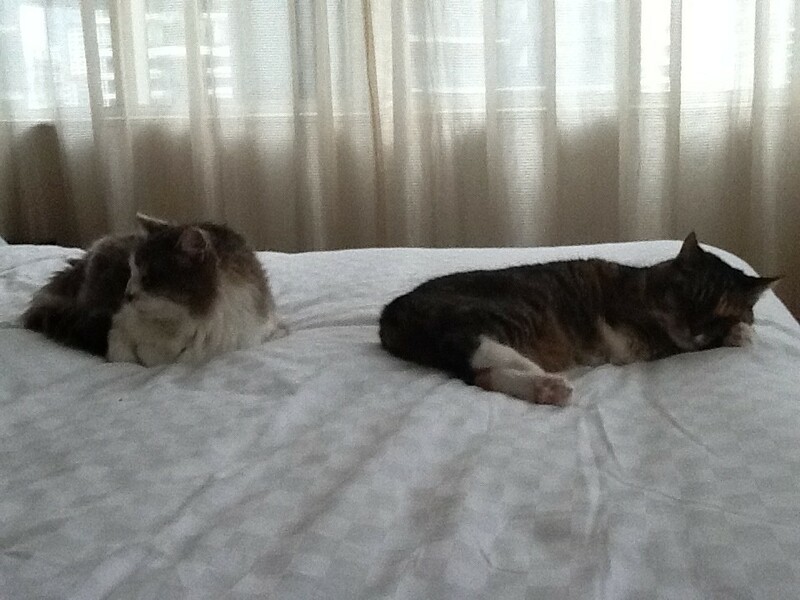 Our elderly cats, Chloe and Pedro, made the move with us to Singapore. Chloe is 16 and Pedro is 15, which makes then 80 year olds, according to our vet. Needless to say, quarantine was particularly hard on these guys. Pedro had the hardest time with it. For one, he had been having some kidney issues before we left, but his numbers were not so bad that he couldn’t travel. However, in quarantine, they fed them really cheap cat food, and when he arrived, he had lost a ton of hair, a ton of weight and looked rather downtrodden. The worst, though, was the urinary tract infection he developed from the cheap food and stress. Poor thing, he had blood in his urine, and seemed agitated and stressed. I took him to the vet here, and he got an antibiotic shot. It didn’t seem to help much, and he started crying really loudly in the middle of the night every night, waking me up three times a night like a newborn. The worst part, though, was the spraying. He sprayed my Italian leather sofa and the dining room chairs. He sprayed the rocking chair in the kids room. He sprayed Isabel’s stroller. It has been a nightmare. He was really ruining my house, and we couldn’t even buy rugs for our new home because we were afraid he would ruin them. Yesterday, I went back again for more blood work, and sure enough, he is in the early stages of kidney disease now. He is on a prescription diet, and we got a calming spray, called Feliway Natural Spray, made up of cat pheromones to help him with the stress. He was also diagnosed with arthritis. I was skeptical that anything would help him, and secretly hoped a python would take off with him if I let him outside. Today, though, a day after starting the kidney disease diet and spraying his favorite things with cat pheromones, he has calmed down. He’s not wandering around agitated, hopelessly meowing like he is lost. He has calmly napped all morning, and nothing has been sprayed since he came home. The day before, he had sprayed three things before 10 am. Finally, I am feeling hopeful that this cat will adjust to his new life, and not destroy my house in the process. The other cat, Chloe, made it through quarantine just fine. Even though she is older, nothing seems to phase her. She just sleeps most of the time, and seems really happy just to have her people back. Hopefully now our cats will both be happy.